Cedar Roughs is a P1K located in Napa County on the west side of Lake Berryessa. 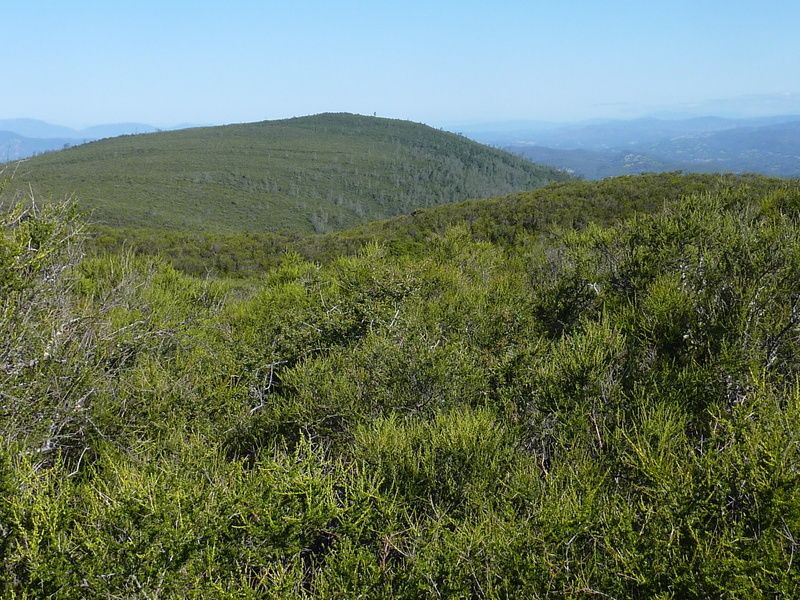 It's also the highpoint and centerpiece of the Cedar Roughs Wilderness. It has been on my radar for a number of years but the satellite photos show what looks to be some of the most impenetrable brush in the state and has hindered my getting up any real enthusiasm to give it a try. Then in 2016 David Sanger and Daryn Dodge managed to get to the summit, followed seven months later by a second group of peakbaggers including Andrew Kirmse, Jerry Kohn and Bob McLaughlin. They had used similar routes judging by their GPS tracks loaded on PB, a good sign - different tracks would have suggested random thrashing through brush, but these were pretty consistent. Maybe it wasn't so bad? It seemed worth a try. I sent out an email to a number of others I thought might be interested, getting back a response from Jeff. He and his buddy Jose would meet me at the Smittle Creek Day Use area along the west shore of the lake at 7a on Saturday. I intended to extend the outing by adding nearby Iron Mtn as a bonus, making for an 11.5mi hike with just under 4,000ft of gain. Not hard by regular measure, but the unknown of the bushwhacking could easily keep us out hours longer than usual. As we came to find, the bushwhacking was surprisingly minimal and it was a fine outing. Hats off to David and Daryn for pioneering the route. The sign at the Smittle Creek picnic area has posted hours of "Sunrise to Sunset" but there was no one anywhere near sunrise to open the gate when I arrived half an hour early. No matter, there is plenty of usable parking on the other side of the road outside the picnic area. Jeff and Jose drove in from Middleton, not far from where they live in Lake County to the northwest. Both work for Calpine in their geothermal operations in the county, which prompted some inquiries later on my part about access to some of their lands. We hiked along the pavement for a short distance to reach the locked gate to a gravel road heading west. Daryn had mentioned that this land had been purchased by the Napa Land Trust, and though not exactly open to the public, it seemed a low-risk route into the Wilderness area. We followed the good road for only a short distance before turning off onto a lesser dirt road that showed almost no signs of use save for cow and deer tracks. We followed this through some lovely meadow areas with flowers overlooking Lake Berryessa before dropping a short distance to Smittle Creek. After an easy crossing the road continues on the other side, climbing 1,000ft up to Trout Creek Ridge, offering still better views of the lake behind us. At a junction on the ridge we paused to consider our options. I suggested we head to Iron Mtn first since we might not have the energy or will to do so later should the bushwhacking prove exhausting. The others concurred. We had trouble finding the old road shown on the topo map leading up to Iron Mtn from the junction we'd stopped at. My GPS didn't show this road, but the others could see it on their phones when they pulled up the peakbagger app. Somewhat comically, we pointed in various directions before agreeing it should be "just through the woods there". Thinking we were almost in spitting distance, we enthusiastically jumped into the woods, starting a regrettable quarter mile thrashing through, under and around thickets rife with poison oak underfoot. We'd pause, pull out the phones, point them around, and then thrash some more. After about 15-20min of this nonsense, we finally stumbled onto the old road we'd been looking far. I'd taken a mean cut across my arm that drew blood and a poke in the eyeball with a stick that had me wincing for the next half hour. The others faired similarly on what turned out to be the crux of the day, totally unnecessary. Once on the road, we found it was in decent shape for foot travel, with evidence of old clipping along the way to keep it navigable. There was some ducking in places and brushing some branches aside, but we made good progress and covered the last 3/4mi in 20min. We found a survey stick at the summit, slightly askew, no register or benchmark in the chaparral surrounding it. The summit provided us with good views of the lake and our main goal, Cedar Roughs to the northwest. In following the road back down, it was easy to see how we had missed it near the junction, the old roadbed now overgrown in a shallow meadow area with tall grass. We returned to the junction and headed north along the better dirt road going across the top of Trout Creek Ridge in that direction. This route can be followed for a number of miles north to the Pope Creek inlet to the lake, but we went only a mile before forking down a spur road that soon ends at a pair of rock pillars. The southern of the two was higher and more interesting-looking and I went over to see if I could scramble up it. Though somewhat loose, there are decent holds and I was within about 5ft of the top when the air was filled with the screeching of a pair of birds flying in circles overhead. The others identified them as perigrine falcons at which point I immediately announced I was coming down. Seems I had interrupted a nesting pair in the area, probably atop the formation I was trying to climb. The birds kept up their cries until we had descended the steep slope between the two pillars down to Trout Creek at which point they went back to their regular business. Later we would spot a bald eagle flying overhead and one of the same falcons swooping down and harrassing the eagle until it had left the area. Trout Creek flows through a narrow canyon with steep embankments on both sides. We had some trouble climbing out the other side because it was so steep and loose. The better route is described here which we used on the way back: After passing through pillars, we trended left (south) down to the creek, but should have continued south along the creek a short distance until a side drainage is found coming down from the west. The left (south) side of this drainage has the least brush though there is much unavoidable poison oak underfoot - you have to treat your shoes and pant cuffs as contaminated and deal with it. Animal (and now some people) trails help one climb up this drainage for 1,000ft to the summit of Cedar Roughs. The going gets better as one ascends, occasionally breaking out onto grassy slopes, continuing on the left side of the drainage until one reaches the upper rocky slopes filled with California junipers. Here the going gets downright pleasant and the poison oak all but disappears. The GPSr helped us stay close to the tracks laid down by the previous parties and just after 11a we reached the top. The views are lacking here due to the trees, but there is plenty of room under the forest canopy to sit and relax. We had no trouble finding the rock cairn and register left by Daryn and David, taking about 30min at the summit to eat lunch and rest.